The Pima Indians, Akimel O'odham, are known for their fine Indian baskets. 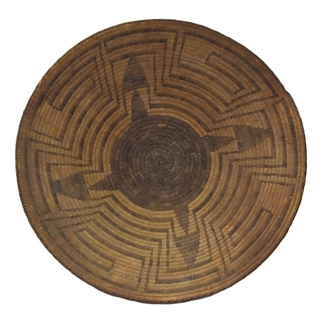 Pima Indian basket materials are Devils Claw, willow and Bear grass. The symbol of the Salt River Pima Indian is the Man in the Maze. The legend depicts the experiences which occur during the journey through the maze of life. At the center of the maze are ones dreams and goals and when one reaches the center they are met by the Sun God who passes them on to the next world. Other Pima Native American Indian Basket forms include trays, and Ollas with both animal and human figures. Large Pima Basket, c. 1900, 8.5" x 15.25"
Large Pima Tray, c. 1900, 3.5" x 19.5"
Pima Basket c. 1890-1900s, 3.75" x 15"
Pima Basket c. 1900s, 4.25" x 14.5"
Pima Basket c. 1900s, 5" x 16"
Pima Basket with Abstract Geometric Design c. 1890s, 4.5" x 15"
Pima Basket with Abstract Geometric Designs c. 1920s, 3" x 13"
Pima Basket with Custom Stand, circa 1890s, 16"
Pima Basket, c. 1900, 3" x 15"
Pima Basket, c. 1900, 5" x 19"
Pima Basket, c. 1910, 1.25" x 12"
Pima Basket, c. 1920, 5.25" x 12.5"
Pima Figurative Olla, c. 1920s, 8" x 9.75"
Pima Polychrome Basket, c. 1890, 7.5" x 14"
Pima Rectangular Basket, c. 1910, 3.875" x 7.25" X 5"
Pima Tray c. 1900, 2" x 16"
Pima Tray with Geometric Design c. 1900s, 1.5" x 12"
Pima Tray with Geometric Design c. 1900s, 3" x 11.5"
Pima Tray, c. 1890, 6.5" x 19.75"
Pima Wine Basket c. 1890s, 9" x 17.75"